After beating the Kiwis on their home soil in the ODI series after ten long years, Team India is ready to shine in the T20 format. India won the series in the third match itself under the leadership of Virat Kohli. The Kiwis, however, would be hoping to bounce back from the series defeat and clinch the T20I series. Kane Williamson must be eager to lead his team from the front as he has failed to perform in this series with the bat. The Blue Brigade made a great comeback in the final ODI after they were reeling for 18-4 in the first innings. They looked a bit agitated in the middle, and the Indian fate seemed similar to the fourth ODI. 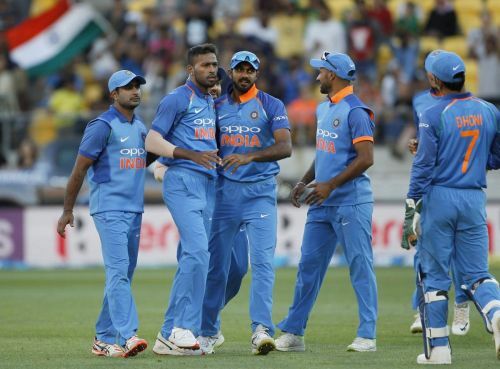 Ambati Rayudu played a sensible knock under pressure along with Vijay Shankar to bring them back into the contest. Hardik Pandya also played a crucial inning to take the visitors to a total of 252. The Black Caps could only manage to score 217 runs in 44.1 overs while chasing and lost the match by 35 runs. Team India would be aiming to seal this T20I series and end this historic tour on a high. The visitors will be without their best batsman (Virat Kohli) and best bowler (Jasprit Bumrah) in this series. Rohit Sharma will lead the Indian team in Kohli’s absence. Rishabh Pant, Siddharth Kaul and Krunal Pandya will join the squad for the three-match series. The Kiwis will miss Martin Guptill due to his back injury; Jimmy Neesham is set to replace him. Date: Wednesday, February 06, 2019. Rishabh Pant can be included in the playing XI as a middle order batsman. Either Krunal or Chahal will start in the playing XI. Martin Guptill has been ruled out due to a back injury. All-rounder James Neesham is set to replace him.